No one sets out to be an international slot machine kingpin: it just sort of happens. Our friends over at Wired took a look at Rodolfo Rodriguez Cabrera, who went from a Cuban engineering student to the head of a multi-million dollar bootlegging scheme. Like any good hacker, Cabrera decided to express his admiration for IGT's technology by trying to beat it. Using blueprints meant to assist casino service personnel, he figured out a way to solder a half-dozen jumper wires between the memory cards and the motherboards, completing circuits that circumvented the machine's security. This gave him the ability to load any IGT game he wanted onto the boards. Demand for these new machines was so strong that Cabrera had to go on a hiring spree; FE Electronic's staff ballooned to 20 employees; most spent their days soldering jumper wires onto IGT's proprietary circuit boards. Cabrera, meanwhile, continued to hone his mastery of the machines. He figured out a way to make the games work with just four or five memory cards each, instead of the 16 cards IGT normally uses. In the end, Cabrera was done in by his own success. His bootlegged slot machines became so popular that IGT's sales fell off the map in some parts of the world. He was arrested, but initially he was only held for a few days and told he'd face some community service. But that obviously wasn't going to stand: he was rearrested and now might be the first prisoner ever extradited from Latvia to the United States. 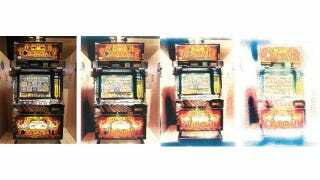 For the full story of Rodolfo Camrera, and some more background on the slot machine as an institution, head over to the feature at [Wired].